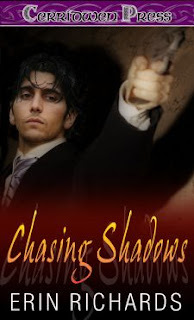 Writerly Ramblings: Chasing Shadows Now Available! Available now at Cerridwen Press! A Romantic Suspense with a Paranormal Twist! Past and present collide when Juliana Westwood returns home after twelve years and experiences psychic dreams of a girl’s abduction. While helping the police, Juliana risks her life delving into the kidnapper’s mind. To complicate matters, the lead detective—Alex MacKenzie—is the child’s uncle, the man Juliana’s psychic curse forced her to leave behind so long ago. Juliana and Alex reconnect in a race against time chasing the psychopath who could destroy Alex’s niece…and the woman he’s never stopped loving.